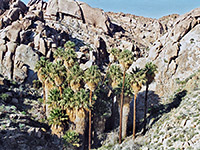 The best of the relatively few day hikes in Joshua Tree National Park is the 4 mile path to Lost Palms Oasis, a sheltered steep-sided ravine that conceals a flourishing group of over 100 California fan palm trees, one of only six such groves in the park. The others are Oasis of Mara, next to the main visitor center in Twentynine Palms, Fortynine Palms Oasis, Munsen Canyon and Victory Palms (both a short distance east of the Lost Palms), and Cottonwood Spring. The journey passes over rocky ridges and through narrow sandy washes, passing many cacti and large groups of the imposing monzonite boulders, although no Joshua trees as the elevation is too low. In spring (March and April are the peak months) the landscape is made even more colorful by abundant, varied wildflowers - over 30 species are found in this area. Lost Palms Oasis Trail topographic map. 12 views of the Lost Palms Oasis Trail. The Lost Palms Oasis hike begins at Cottonwood Spring, close to the visitor center 6 miles inside the southern park boundary. The spring produces water all year and helps sustain an oasis containing a few dozen palm trees although this is not a natural group, being planted by settlers in the late nineteenth century. Nearby is the Cottonwood Spring Campground and a 3 mile loop trail that passes many types of desert plants, an historic mill site and some shafts and other relics from a disused gold mine on Mastodon Peak. The path to the Lost Palms branches off southeastwards and is essentially straight for the 4 miles to the oasis, with a small overall elevation gain of 450 feet. 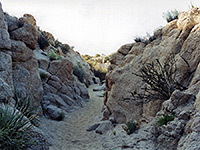 The surroundings are impressive from start to finish - many outcrops of the granitic boulders rise from an undulating landscape of ridges, plateaus, small canyons and rocky washes; between the rocks the ground is covered by coarse whitish sand through which cacti, bushes and wildflowers grow profusely - clean, pristine scenery. In spring, the dry washes are especially pretty as flowers grow in the smooth white sandy streambeds while many more line the edges, intermingled with flowering bushes; most visible of these are red chuparosa, yellow brittlebush and the blue-purple indigo bush. The main species of cacti are echinocereus, ferocactus (California barrel cactus), mammillaria, cholla and other types of opuntia. Each mile along the well-used trail is marked by a post. For the first mile, the path leads up a shallow rocky canyon, gaining height steadily. The second crosses mostly flat and open land with a few dry washes (see panorama), while the third is through more up and down scenery with ridges and gullies. The final section is similar, ending with a longish canyon past some huge rocks to an overlook on a narrow ridge above the oasis and the palm trees. 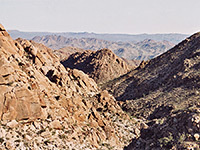 From here, Lost Palms Canyon stretches away to the southeast, and beyond a huge area of desert hills is visible, as far as the plateau beside the lower Colorado River valley. The middle section of the trail has similarly far-reaching views in the southwest direction - over the Salton Sea, the Jacumba Mountains and other ranges in Mexico, 80 miles away. From the ridge overlooking the canyon, a steep but short path descends to the oasis, then a primitive unmaintained trail continues along the streambed for a further 5 miles, meeting a 4WD track outside the park boundary. At the oasis, the palm trees are large and flourishing - the deep, shaded ravine and water from an underground spring create a most microclimate that creates ideal growing conditions. More trees can be seen by climbing up large boulders to the head of the canyon.